"I believe in you!" (友好度は変わりません) Alex thanks you for your support and says that he'll remember it. "Wow, you're really arrogant." (友好度は変わりません) Alex says you're a little jealous and leaves. Alex will send you a letter to meet him at the Saloon after dark. After receiving the letter, enter the Saloon between 7pm and 10pm. Alex reserves a private room for your dinner date. 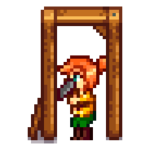 Gus plays the violin for you two and Emily will bring in your food. If the player is female, Alex confesses that he's had a crush on you since the two of you first met, and although his crushes in the past faded away quickly, his feelings for you kept growing. If the player is male, Alex confesses he's been drawn to you since the two of you first met; although he denied these feelings at first, he's now decided to follow his heart. "I feel the same way." (友好度は変わりません) Alex is elated that the both of you were finally able to admit your feelings to each other. He happily digs into his steak. Dusty suddenly bursts through the window, salivating at the smell of food. "I'm sorry... I don't feel that way about you." (友好度は変わりません) Alex is crushed and apologizes for making you uncomfortable. He loses his appetite. Go to the beach on a rainy day to find the Old Mariner. Talk to the Mariner to purchase the Mermaid's Pendant for 5,000g. After you give the pendant to Alex, he will accept it and agree to marriage. Marriage will occur three days later regardless of season. 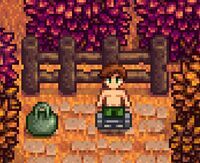 Once married, Alex will move into the farmhouse. Like other marriage candidates, he will add his own room off to the side of the bedroom. 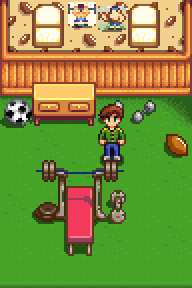 He'll also setup a workout space behind the farmhouse where he'll sometimes go to lift weights. 2. Gifts food items to you in the morning or the evening. If inventory is full, you will not receive the item. Alex's look evolved over the years the game was in development. Here's a timeline showing how ConcernedApe's art and Alex's style changed over the years before the game was launched. Alex was previously named Josh.